The 2017 Gongfarmer’s Almanac Volume 7: Adventures and Settings , was written by Steven Bean, Eric Betts, Daniel J. Bishop, Jarret Crader, Terra Frank, and Gabriel Pérez Gallardi. Artwork is by Doug Kovacs, Marc Radle, Shawn Brewer, Dan Domme, Gabriel Pérez Gallardi, Christian Kessler, SGT Dave, Matt Sutton, Shyloh Wideman, and Clayton Williams. The publisher is the Gongfarmer's Local #282. Disclosure: I wrote a submission in this volume. Unlike previous years' Gongfarmer's Almanacs, five volumes of the 2017 edition have an overarching theme - the roiling, ever-changing plane of Pandemonium. Volume 7 does not follow this theme, but rather contains content similar to what we've seen in previous years. 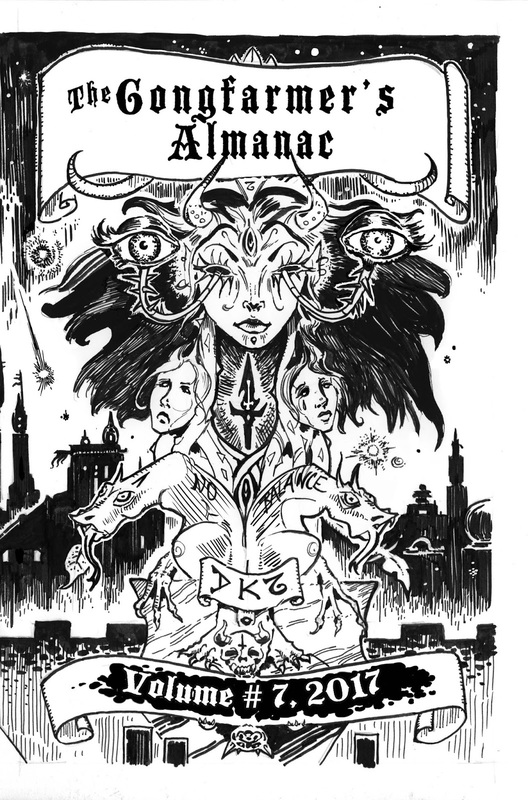 Crypt of the Lost Hyms: This adventure, by Gabriel Pérez Gallardi (cartography and symbology by Christian Kessler), revisits Ur-Hadad, the titular city of Metal Gods of Ur-Hadad. The adventure isn't long, so I will try not to do anything to spoil it. Suffice to say, knowledge of the Metal Gods will go a long way. 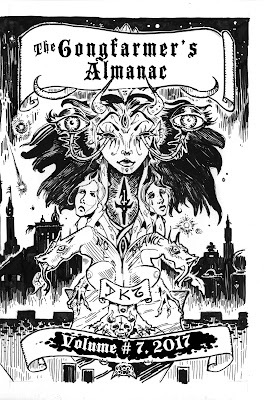 How to Win Friends and Influence People, DCC Style: In this article, Jarret Crader gives you tricks, tips, and support for running Dungeon Crawl Classics in public venues. Bloody Hound: Steven Bean supplies a new class for Nowhere City Nights. The Bloody Hound is the film noir detective recast through a Nowhere City Nights lens. Rules and Skills for Detective Work in Nowhere City Nights: And then Steven Bean supplies the rules you need to make use of that class. Taken together, you have the makings of a detective in any sort of urban DCC environment. The Lost Patrol: A Zero-Level Funnel for Trench Crawl Classics: There are a lot of flavors of Dungeon Crawl Classics available now. You can crawljam, crawl under a broken moon, visit Drongo or the Purple Planet, crawl with mutants, or play noir-style characters with magic. This adventure, by Eric Betts, takes you into World War II with more than a dash of the occult. Your infantry group, the 1023rd Rifle Regiment, has been attacking into Romania striking toward Hitler’s oil fields...or so the rumors say. You are not really sure where you are, just that you arrived by truck less than two weeks ago and have been marching and fighting since. Mostly, fighting consists of running for cover when German artillery starts to blow your fellow soldiers apart. Three days ago, the regiment stopped on this rise and you dug the trench you’ve been living in since. It is miserable, but at least you have a place to hide from the artillery. Trench Crawl Classics: Eric Betts supplies the rules you need to leap into occult World War II action, using Dungeon Crawl Classics. Also recommended are the firearms rules from Crawl #8. In this case, the PCs are conscripts in the Red Army, but it would be easy enough to expand. Notably, there are no new classes described - the occult is real, and your PC might well end up a cleric or wizard! The Vampire, Returned: Author Terra Frank provides a series of tables for creating unique vampires. These do not create statblocks, but they do provide the nature of the creature you would then stat up. Thirteen Brides of Blood: Finally, the issue ends with a zero-level funnel by Daniel J. Bishop, with artwork by Shawn Brewer and cartography by Shyloh Wideman. I mention this because the adventure was largely written to use existing cartography, supplied by Shyloh Wideman over the G+ DCC community. Without his support and enthusiasm, it wouldn't have happened! Vampires haunt the land! Erasmus Cordwainer Blood has existed for countless centuries, feeding off the villages closest to his hidden lair almost as a form of sport. Usually, his victims are those who remain out beyond the setting of the sun, lone travellers, or the inhabitants of isolated farmsteads. Once every seven years, though, villagers from number of nearby communities simply disappear. It is said, in hushed whispers, that Blood has taken them to feed his Brides. My pleasure. I hope to see more Trench Crawl Classics!